Kremersite is a rare mineral which is a hydrated multiple chloride of iron, ammonium, and potassium with the formula: (NH4)2Fe3+Cl5H2O. It is an orthorhombic-dipyramidal mineral containing chlorine, hydrogen, hydrogen, iron, nitrogen, oxygen, and potassium. 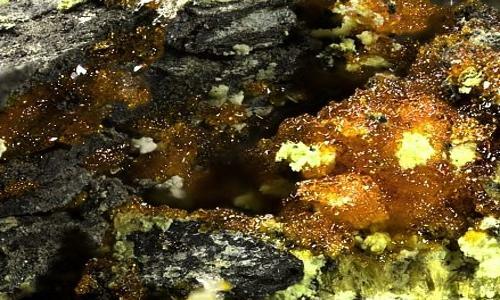 It is a water-soluble mineral that is found around volcanic fumaroles. Habit: Pseudo Octahedral – Crystals show an octahedral outline. Kremersite is a brown-red to an orange mineral that crystallizes in the orthorhombic system. It is a volcanic mineral product consisting of a hydrous chloride of potassium, ammonium, and iron that occurs in red octahedrons. Occurrence: As sublimates around fumaroles. Occurs at Vesuvius, Italy and Mt. Etna, Sicily. It was discovered in 1853 and named for the German chemist, Peter Kremers (born 1827). 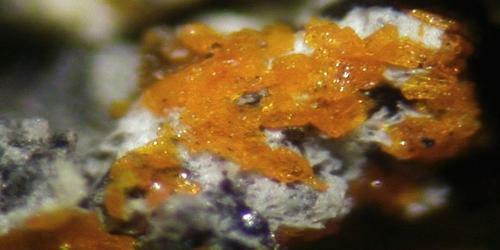 It is usually as tiny crystals, sometimes fibrous. Relatively large, deep red crystals, up to ca. 3 mm in size, were found coalesced in a single block from a burning heap in Radlin, Poland. Association: Erythrosiderite, molysite, hematite (Vesuvius, Italy); erythrosiderite (Kliuchevsky volcano, Russia).